Set to a beautiful song, this traditional line dance is delicate and graceful. The Azerbaijani operetta, Arshin Mal Alan (The Cloth Peddler), was written by Uzeyir Hajibeyov 100 years ago. This dance scene depicts the hero who wants to pick his own bride at a time when girls were hidden away before marriage. He disguises himself as a peddler in order to gain access to a household with unmarried daughters. has dramatic spins and flirtatious elements. bride leaving her home, followed by the exuberant joy of a wedding celebration. In this famous and challenging piece, dancers balance tea glasses while performing intricate arm movements and spins. 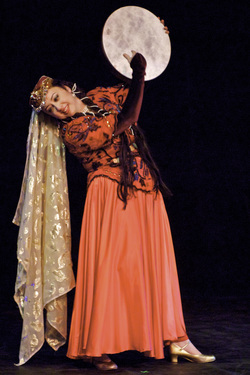 One of the "classics" of Azerbaijani dance, Terekeme is an ancient lyrical choreography oftern performed at weddings.